← Love the sinner but hate the sin? There will be a memorial service for Mervyn Kingston, the co-counder of Changing Attitude Ireland, in St George’s, High Street, Belfast, at 11.30am-12.30pm on Saturday 8 February. 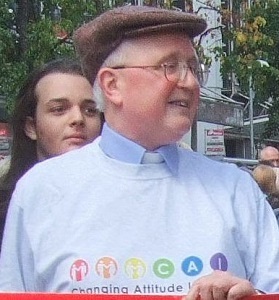 Mervyn, who died on 2 August 2013, was a pioneer of the gay Christian movement in Ireland. Faith and Pride merely builds on the work he started. I'm Andrew. Belfast born, Cambridge educated, working in Dublin. Married to John. I earn my living by writing, mainly documentation, but I write fiction as well. Posted on 23 January, 2014, in In Memoriam, News. Bookmark the permalink. Leave a comment. So Me. Are you in? Faith and Pride is proud to support the Equality Commission for Northern Ireland’s So Me campaign.